sailboat. 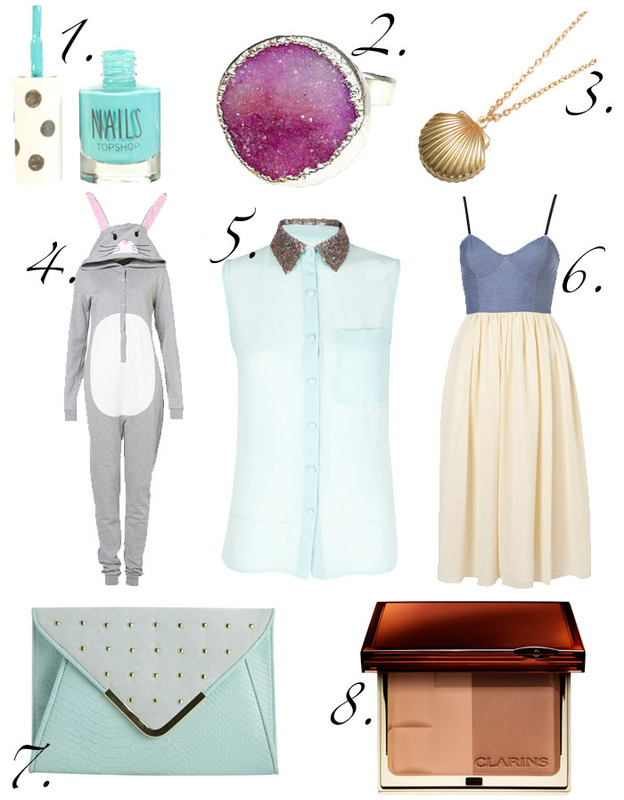 : Mid Week Wishlist # 6. Mid Week Wishlist # 6. 1. Topshop Pool Party nail polish. 2. Love Hearts & Crosses crystal ring. 3. Cheap Frills Secrets of the Seas Shell necklace. 4. Topshop Bunny onesie. 5. Lavish Alice mint blouse with a sequin collar. 6. Flissy Dress by Motel via Topshop. 7. Matalan Stud Envelope clutch. 8. Clarins bronzer. 1. My current inability to open the clasp on my Pandora bracelet by myself has inspired me to stop biting my nails once and for all. It's such a horrible habit and I really need to shake it now. Pretty nail polish colours are another reason for me to grow my nails because currently nail polish just makes my horrible stubby nails look even worse. Pool Party nail polish from Topshop looks like the perfect turquoise colour for summer. I adore blue nail polish and this one reminds me of a crystal clear ocean somewhere tropical. I have never tried a Topshop nail polish before but I've heard good things about them and at only £5 I might purchase this one to put on my bedside table as inspiration to finally stop my nail biting! 2. How stunning is this ring from Love Hearts & Crosses?! As soon as I saw it I fell in love with the colour, it's beautiful and I bet it would look even more stunning in the sunshine! It's sparkly enough to satisfy my inner magpie but not too over the top that it would overpower an entire outfit. It's lovely! 3. I am completely in love with anything seaside related at the moment so the Secrets of the Seas Shell necklace from Cheap Frills is absolutely perfect. I love that it's so simple and I think it would look as beautiful with a simple white shirt & jeans as it would with a cute summer dress and flats. It even opens up to reveal a little pearl inside, how adorable! 4. There's really not much to say about this one other than TOPSHOP BUNNY ONESIE! 5. Lavish Alice is an online boutique that I have been finding myself browsing on an almost weekly basis, they have some truly gorgeous pieces and I adore this mint green sleeveless blouse with a sequin collar detail. It's simple but the sequins on the collar are the perfect addition and I think it's just so sweet. 6. The structured denim bralet top and the flowy skirt at the bottom make this Flissy Dress from Motel via Topshop absolutely perfect. I wish I had a spare £58 to splash out on this dress because I think it's absolutely stunning and I have so many different ideas of how to style is whizzing around in my head! I love that the skirt is a midi length, so often summer dresses and skirts are way too short for me, but this couldn't be more perfect. Oh how I wish it could be sitting in my wardrobe right now! 7. Matalan are on fire with their accessories at the moment, there are so many items from their website that I'm coveting but this Stud Envelope Clutch in mint green is especially lovely! I don't own any clutch bags at all & I'm thinking I need to change that asap! 8. In terms of make up, it's safe to say I've been bitten by the bronzing powder bug! I have heard so many good things about the Clarins Bronzing Duo and everything about it from the shade range to the packaging looks so perfect. Are you lusting over anything at the moment? The onesie is AMAZING! So cute. I LOVE that ring, it's so pretty. Looks like a tiny galaxy or something! THAT TOPSHOP BUNNY ONESIE OMO I WANT IT SOOO BAD! Also the mint blouse looks super sleek! i want an envelope clutch so badly! love the one you've chosen to feature. I love that motel dress, and the Cheap Frils necklace! They look so summery and pretty! That dress is lovely, so adorable! oh my god, that bunny onesie is amazing! i had a little look for a cat one and got a bit upset that there wasn't one, think i might get the bunny anyway.. but £34? wahhhh! i love that dress so much but midi dresses just drown me. so many pretty ones around at the moment too. it's quite gutting! Five Things & Five Blogs I Love Friday #36. July 2012 GlossyBox: Festival Glam. What I Wore: A sunny afternoon & a Bambi dress! The One Hundred Pound ASOS Challenge. Five Things & Five Blogs I Love Friday #35. Monthly Favourites: June Two Thousand and Twelve. One Hundred Questions No One Asks!